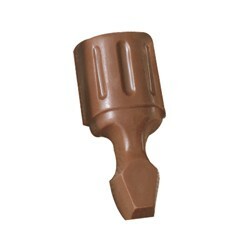 Custom Chocolate Construction gifts - perfect powertools. Build the best gift possible for the Construction worker in your organization or in your personal family. Choose Milk or Dark Chocolate & Design. Individually Wrapped in Cellophane. Quantity of each tool must meet minimum quantities. Limited Personalization Area. Hammer - 1 1/4" x 1/4".